Happy Monday! I'm just popping in to give you your daily dose of color! What's romantic and elegant and all kinds of gorgeous? Say hello to this beauty of a palette. Now, it's no secret that I've long been a fan of these beautiful shades. And can you blame me? I don't know what it is, but there's just something so sweet about this pairing. I'm loving this wedding cake with it's 3 tiers and it's shimmery finish. Oh, and those bow heels? Yeah, I'm totally in love with those. So super cute, if you ask me! And this beautiful shade of tulle? Talk about a dreamy gown! Would love to be invited to a wedding in these colors. So many beautiful possibilities. So what do you think? Are you liking the way these colors work together? 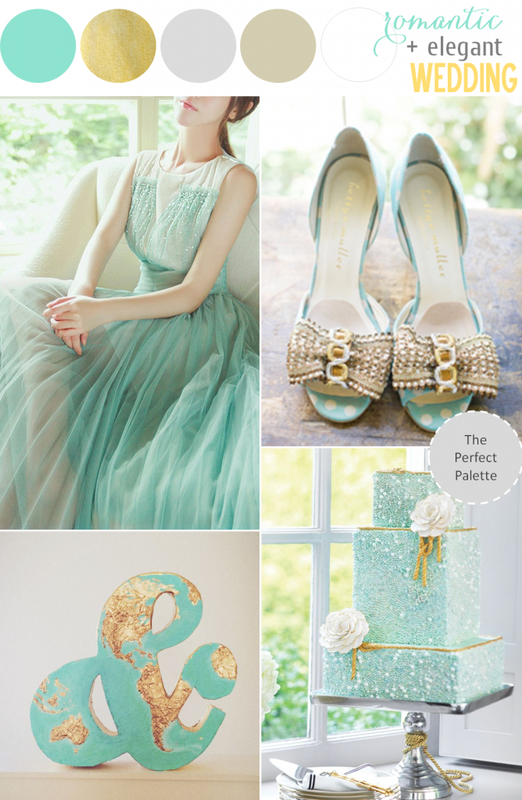 11 Comments " Mint Meets Glittery Gold: Creative Color Ideas "
Love this palette–it's so perfect for summer! Wow! This combo is stunning! Those shoes! That dress! Fan-tastic. You're right, this is such an elegant take on this color combination! Omg! That wedding cake...loving the bling! Absolutely stunning. Love that dress!